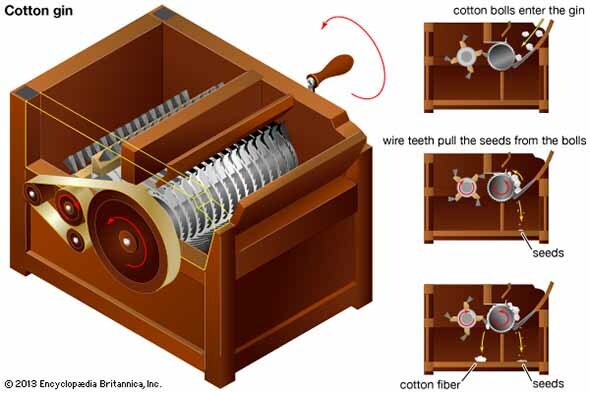 The cotton gin is a machine that is used to separate the seeds from cotton fibers. Before the invention of cotton gin, people had to separate the seeds with their hands. This manual separation process was very time consuming and laborious. But the invention of cotton gin revolutionized the industry of cotton. 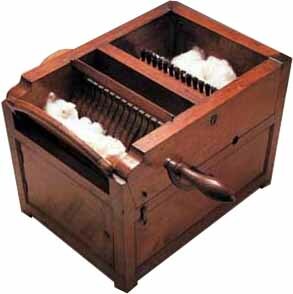 Cotton gin highly reduced the amount of time required to separate the seeds from the cotton fibers. As a result, the cost of the new fabrics made from cotton decreased dramatically and made the cotton a profitable business especially for the South Americans. Workers are separating seeds from cotton fibers with hands. Simple machines to separate seeds from cotton existed centuries before Mr. Eli Whitney’s invention of cotton gin. But, they were only useful for long-staple cotton. South Americans could grow only short-staple cotton, whose seeds were removed manually with hands. Early machines that were used for long-staple cotton were not useful for short-staple cotton. Due to this reason of seed separation process, the cotton was very costly and not a profitable business for South America. 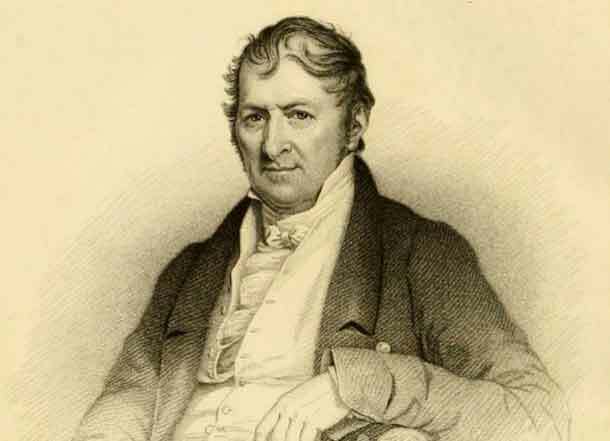 Eli Whitney’s invention of cotton gin made the cotton a profitable business, especially for the southern state. Eli Whitney was a young man and a graduate of Yale. He was a poor guy and was in the need of a job to pay his debts. For this reason, he moved to the south and worked in Georgia as a private tutor on a plantation. There he observed that farmers had a lot of difficulty in separating the seeds from the short-staple cotton. 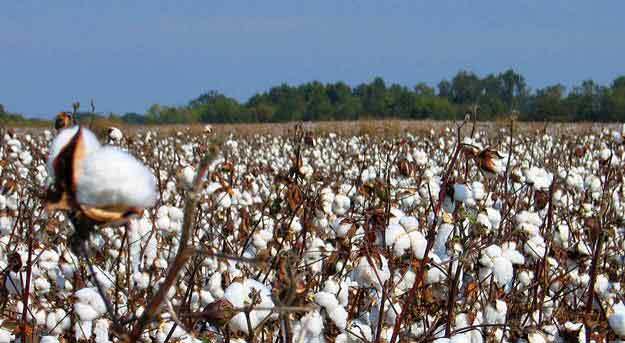 They were in need of a device that can be used to easily separate the seeds to make the cotton a profitable crop. Eli Whitney quickly understood the need of the farmers and was encouraged by his employer lady Catherine Green to find the solution to the problem. Eli Whitney started to work on the seed separation machine that will ease the workers and sped-up the seeds separation. 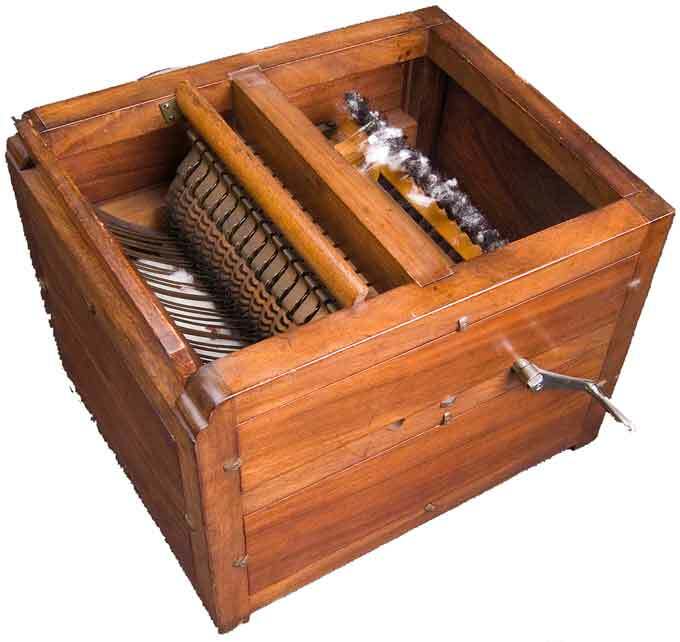 Mr. Whitney worked for seven months and finally in 1793, he invented the machine which he called “Cotton Gin”. 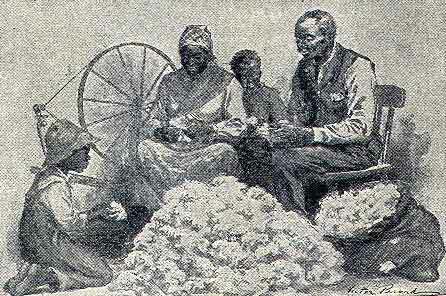 The cotton gin was able to separate the seeds from the short-staple cotton fibers. It was proved very successful invention which made Mr. Whitney a rich man. Mr. Whitney got the patent of the cotton gin in 1794. Whitney’s cotton gin was not very complex. Instead, it was so simple that many mechanics made copies his design and sold them on their own. The cotton gin worked when the crank was turned, which turned the cylinder. The turning cylinder pulled-in the cotton from the small opening and forwarded it towards rotating brushes. Rotating brushes separates the seeds from the cotton and ejects it out of the cotton gin box. The whole machine works due to the set of pulleys and belt that transmits power to every component of the machine. Abdul Wahab, "Cotton Gin," in Science4Fun, April 13, 2019, http://science4fun.info/invention-of-cotton-gin/.